Two of the many things that I'm a sucker for: a well-executed wordless comic story and Christmas sentiment. This series of posts is basically turning into a guidebook on how to tug at my heartstrings, isn't it? Look at that! Bruce cares but he's too much of a (Bat)manly (Bat)man to tell Alfred to his face! Alfred is surprised and touched! I might have to go hug a puppy here! This is from the DC Universe Holiday Bash. 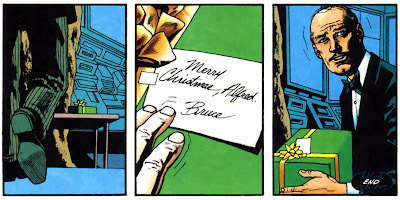 It and the Infinite Holiday Special are heartily recommended Christmas reading - the latter contains possibly the greatest Elseworlds yarn ever. I haven't gotten a chance to pick up this years holiday special yet (there was one, right?) but given DC's prior track record with anthology comics it should be great (tangent: and how great was it that there was a Tales From the Beanworld comic on the shelf this year? I've had Volume 1 sitting on my shelf for about a decade. Hearing that they're going t be reprinting these things was one of my many Christmas miracles this year).